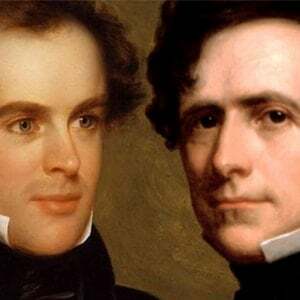 Strange, that one of America’s worst presidents, Franklin Pierce, and one of America’s greatest novelists, Nathaniel Hawthorne, were best friends. Stranger, that Hawthorne died while sleeping just a few feet away from Pierce – who, in fact, discovered him dead. And strangest, perhaps, is that Hawthorne choose Pierce, and Pierce alone, to be with him when he died, by proposing, though sick and weak, that they take a trip together, knocking about New England. In this, life – and its cessation - followed art. “Happy the man that has such a friend when he comes to die!” Hawthorne wrote in The Blithdale Romance. “How many men, I wonder, does one meet with, in a lifetime, whom he would choose for his death-bed companions!” Hawthorne, clearly, had met just one. Pierce tells the story of his friend’s demise, detailing their last trip and the epic moment of Pierce’s discovery of his death. Calvin Coolidge Mourns the Death of His Son, Calvin Jr.
Lucretia Garfield On How Her Husband's Portents at Chicago Convention Foreshadowed His "Fateful Ending"